Your cat doesn't need a fancy store-bought scratchery -- check out our ideas for greening your home. When I moved to California, all I had with me was a suitcase and a cat. Thus, after I arrived at my temporary apartment, my first order of business wasn’t to get something to eat or familiarize myself with the neighborhoodÔÇöI had to find a pet store pronto. I needed cat food, cat litter, litter box supplies, and most importantly because I knew my cat, Furball, liked to scratch, I needed a cat scratching post. I didn’t know where to shop, so I went to the first big-box pet store I could find. That was a big mistake. While it carried all the basic supplies, the selection of cat scratching posts was woefully inadequate. I ended up buying a blue-carpeted monstrosity that cost an obscene amount. I knew it was the wrong height, the wrong angle, and the wrong size — and it even had the wrong type of carpet covering it — but since it was the best option in the store, I bought it. I should have known better. I brought the Smurf-colored eyesore home. Furball scratched it once and then refused to touch it again. 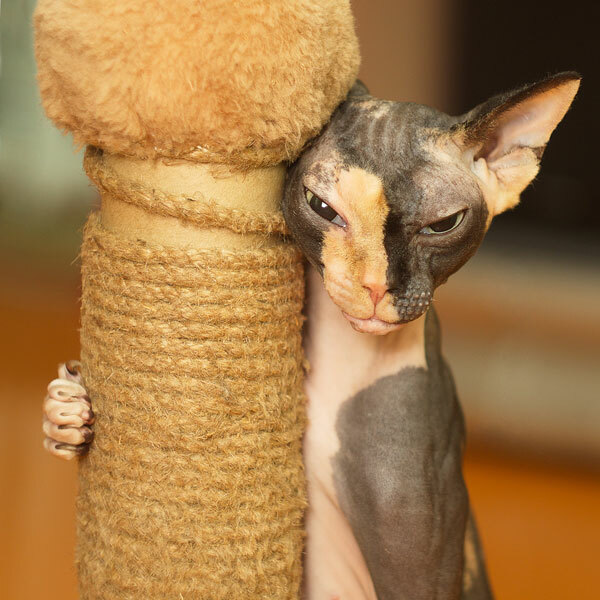 When I finally found a proper scratching post, I was left with a dilemma. I had big, chunky, ugly post I couldn’t easily get rid of. I kept that thing for almost two years before I finally found someone I could regift it to. The whole experience made me realize just how difficult it is to get rid of an old cat scratching post, especially if you don’t want it to end up as landfill. I vowed that moving forward, I would do my best to green my cat’s habits. 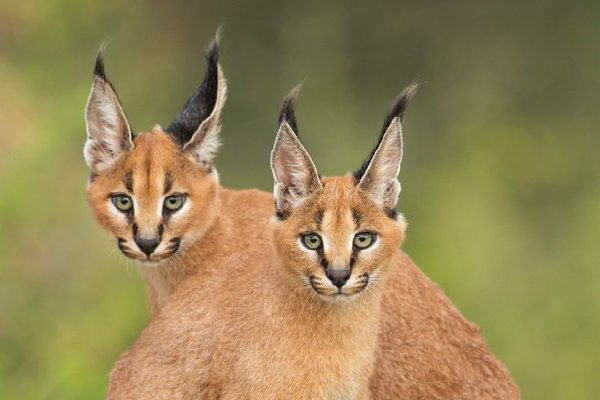 So this Earth Day, I wanted to share with you five greener options for cat scratching posts. Sisal is a twine made from a type of agave plant. Plant-based materials are renewable and can be sustainably harvested. The best part about a sisal-wrapped scratching post is that once the twine gets worn down, you can easily replace it. Simply cut off the old twine and buy some more to wrap around the post. The only downside is that some cats don’t like to stretch their claws on sisal. 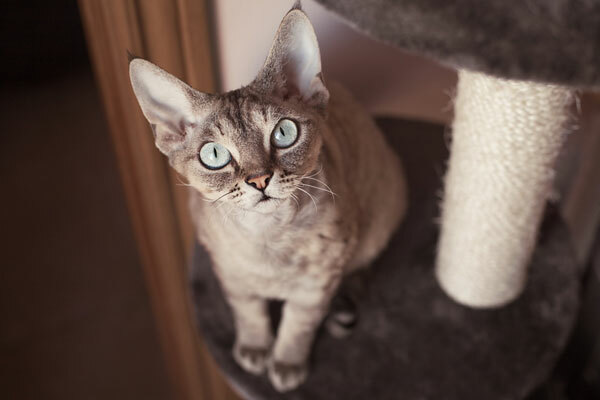 To find out if sisal is a good choice for your cat, check out some of these tips on scratching posts. This is a fun weekend afternoon project that is not only eco-friendly, but wallet-friendly, too. You can buy carpet ends and remnants at flooring stores. Try asking friends, too, as many people who have redone their carpets often have scraps they’ve been keeping for years. 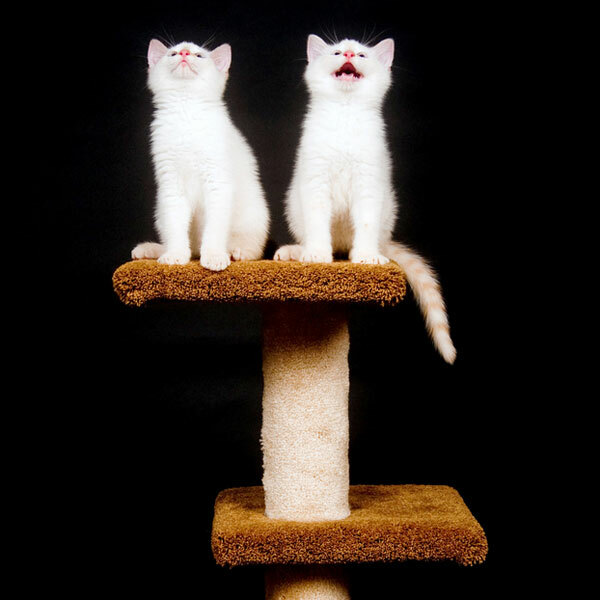 If you’re ready for a fun project, here are detailed instructions on how to recarpet a cat scratching post. ClawSkinz makes replacing the carpet on your cat scratching post a breeze. No tools required! When the carpet gets worn out, all you need to do is slip the carpeted sleeve off the post and then slide on a new one. You’ll minimize waste because you’re only replacing the carpet and not the entire cat scratching post. 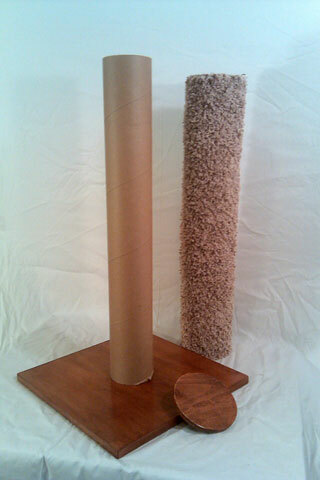 ClawSkinz carpeted scratching posts are available at the ClawSkinz Etsy Shop. 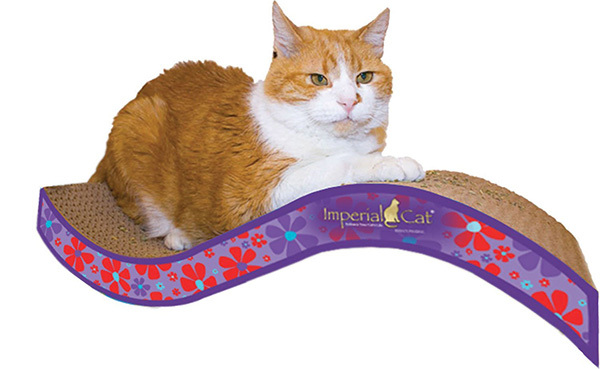 Imperial Cat makes a delightfully attractive line of cardboard scratchers. 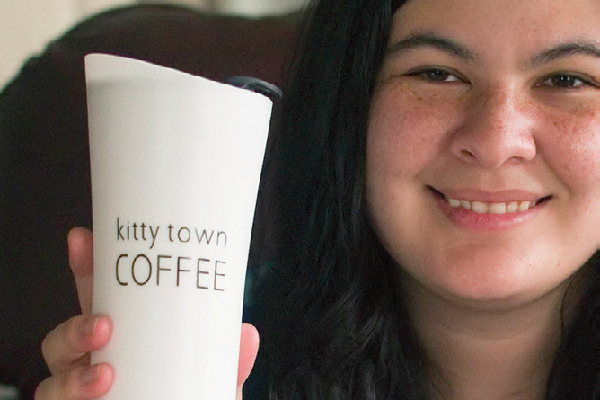 Not only are they fun and whimsical, they’re also eco-friendly. The scratchers are made in the USA from 100% recycled paper and they have labels that are printed with soy-based ink. Best of all, after the scratcher has worn out, you can throw it straight into the recycling bin as you would with any cardboard box. Mountain Cat Trees are cat scratching posts that are made from trees. They look like trees and feel like trees — and best of all, they don’t shed piles of carpet fluff on the floor when your cat scratches them. 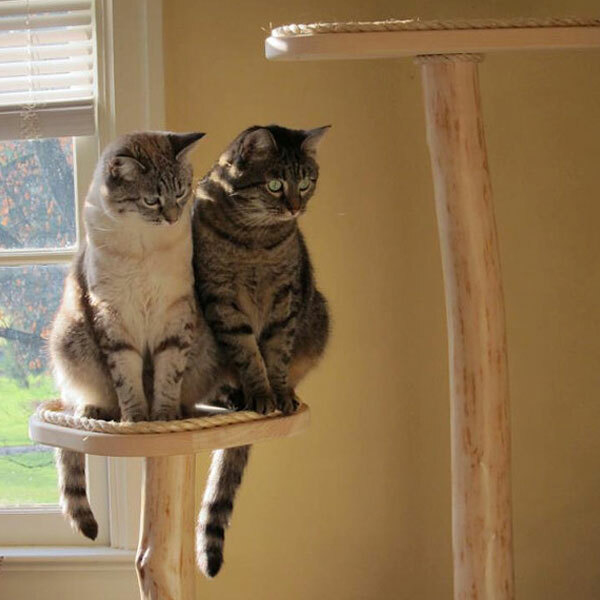 Mountain Cat Trees are lovingly handcrafted in Massachusetts from locally harvested birches.